There are regular opportunities to hear artists speak about their work thoughout the year. 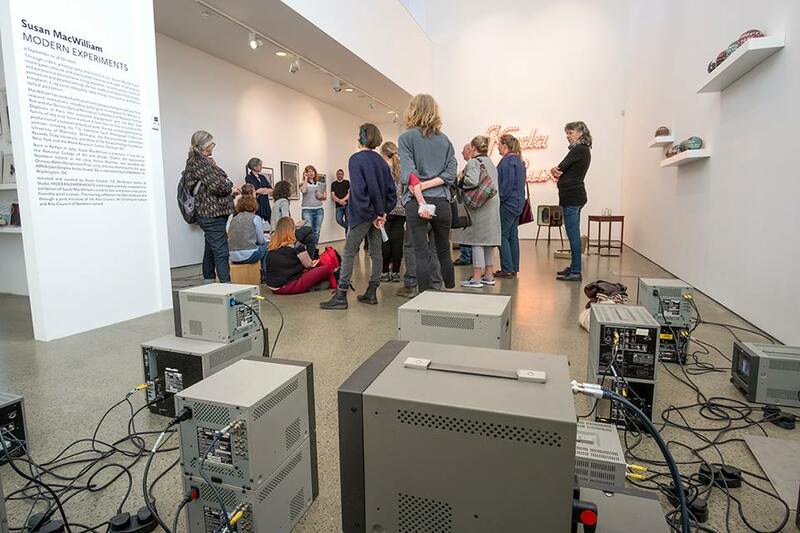 Exhibiting artists present talks in the gallery, artists in residence will often have discussions about their work in the the studios and there is a programme of panel discussions comprising artists and guests from other disciplines. Check our Events page, Residency pages, and our Current Exhibition page for further information. Unfold (16 January to 27 February 2016), In collaboration with Cork Printmakers and Cork County Council. Unfold In Conversation (Saturday 30 January), Johnny Bugler, Rosie Cleary, Simon English, Dominic Fee, Rob Monaghan and Sarah O’ Brien, chaired by Ann Davoren, Director, Uillinn: West Cork Arts Centre and Valerie Byrne, Director, Cork Printmakers. Susan MacWilliam: Modern Experiments (9 September to 18 October 2017). Susan MacWilliam Gallery Talk (Friday 22 September). Photograph by: Kevin O'Farrell.